I'd be interested in hearing everyone's opinion. MacNichol. In my dealings with him it's not opinion. It's fact. I guess it really depends on what specifically you're looking for, but I buy everything I can from them because of thier superior customer service, Mom and Pop type of approach and really competitive pricing. I recommend them to EVERYONE. Thats how good they are. I've never purchased a guitar fro MacNichol, but I have purchased some accessories from them. I agree about the customer service being superior. They are very helpful and informative regarding their products. I've purchased several guitars, including Breedloves, from Guitar Center. I've had very good luck with the guitars. The service ranges from great to questionable depending on which sales person your dealing with. If you can find a salesman that is truely knowledgable, it can help you with an educated purchase. But there have been a few occassions when I've seen some of the newer staff b-s-ing there way through customer questions. My advice would be to research the equipment your looking for and then deal with the sales staff wherever you end up to fine tune the purchase. 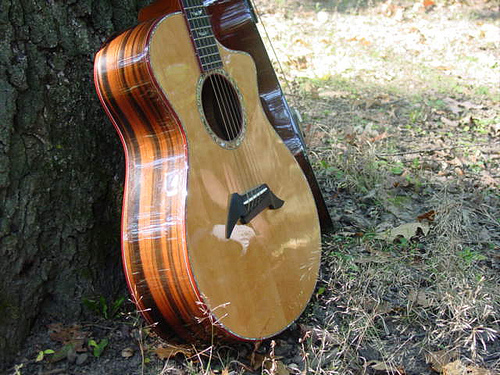 gtrbill wrote: I've never purchased a guitar fro MacNichol, but I have purchased some accessories from them. I agree about the customer service being superior. They are very helpful and informative regarding their products. I can agree with the above, having purchased from the Mac, but I don't think I've purchased instruments from Mac Or GC. Another vote for macNichol/Michael -- great service, prices and you always get a knowledgeable salesperson! Chuck Johnson, their acoustic store manager, not only is an accomplished musician, but extremely knowledgeable about the many components and designs incorporated in the making of great acoustic guitars. And because Apple Music is 3 hours away from Bend, OR, Chuck can arranges for his customers to have a private visit to the Breedlove factory so they can consult, examine and select specific components for their guitar. Although I am now retired, while working, I did have the chance to visit many cities in the US. When visiting Salt Lake City, I made sure I stopped in to see MacNichol's shop. Without question, he is the gold standard for customer support, honesty, and integrity. Although I have not purchased (yet) a guitar from him, because of his ethics and excellent business practices, I would have no concerns about buying a guitar sight unseen from him. Fully agree -- would never buy a guitar without playing it first and 100% behind buying locally! I'm just lucky to have MacNichol's as my local store!! +1 on Apple Music. Chuck is great to work with. While I have not bought a guitar from Apple Music I have talked to Chuck a number of times when I was looking for a specific Breedlove. He was great. So I have to agree with NW Harry and Portland Rain. Over here in the Seattle/Portland area Chuck rocks! All this talk about purchasing new guitars is giving me g.a.s.!!! I'd better stop following this or I'll end up in trouble (again)! I couldn't agree more! I'm heading to a guitar show this Sat. My wife already knows I'm bringing money, so if I keep it reasonable I should be safe. (wish me luck). Sorry,I dont know this didnt go through the first time.I'm having trouble with my computer.